For the chance to win a family ticket to the festival, check out the competition at the end of the post. 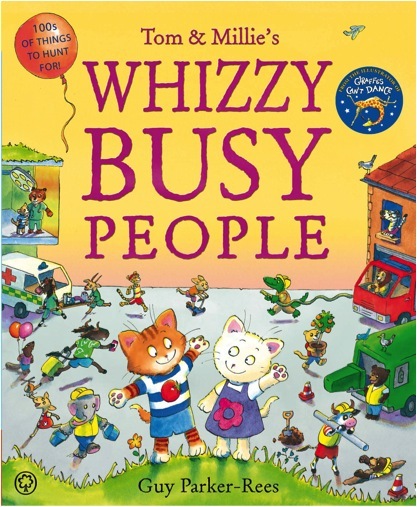 Following on from Tom and Millie’s Great Big Treasure Hunt comes Tom and Millie’s Whizzy Busy People (out in hardback in June when Treasure Hunt is released in paperback). It seeks to answer that very important question for a small child: what is the best job ever? 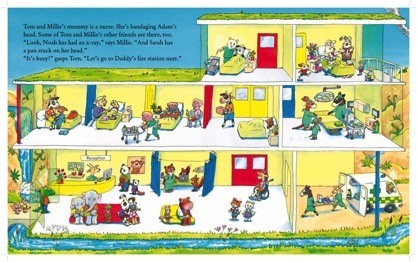 There is the same Richard Scarry inspired busy-ness. 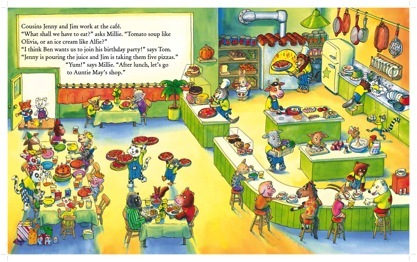 This time Tom and Millie visit the workplace of all their family members, spotting their friends along the way as they seek out the perfect job. The aim of these books was to create a friendly world full of lots of little scenes to pore over, share and talk about with your child. There are hundreds of characters interacting with each other, so something new to spot each time. I also wanted to have the fun element of having to find things on the page. As well as all the characters, I also have to think about creating the whole world they live in. 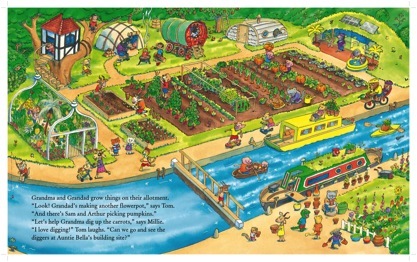 I wanted Tom and Millie’s world to look familiar enough to be recognisable to a child and yet different enough to make it interesting, somewhere you would really want to visit. The key to this is a very subtle and delicate process, I bung in everything I can think of that I like. You will see plenty of palm trees – they always cheer me up and make me think of sunnier climes. I added a few to the recycling centre, it desperately needed something to make it look a bit more exotic! Designing the hospital took quite a bit of thought. It’s quite modernist with chunks of Mondrian block colours and there’s a good sprinkling of Frank Lloyd Wright with that stream and waterfall meandering through it. The café is the sort of place where I like to eat: pretty laid back and loosely based on our local “Bills” but with a good pizza oven thrown in. Because these scenes took so long to paint – with the cast of hundreds – I had to do some of the drawing and painting at home. My youngest, Dylan, who was five at the time, would watch me as I painted and then do his own versions (much better than mine!). 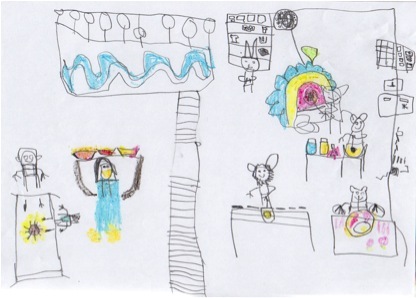 You can see in this one that he’s picked out the penguin and the pizza oven! I love canals and feel there should be much more made of them, so they crop up here and in the recycling centre scene. Of all the spreads this is my favourite – somewhere I would be happy to hang out for quite a while. 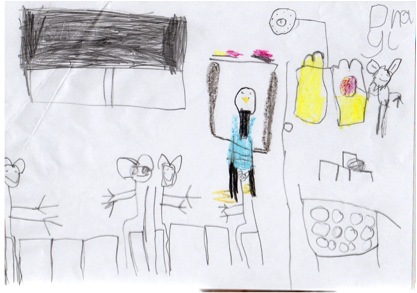 Tom and Millie do find the ‘best job ever’ and I defy you to find a child who would disagree with their choice. But I’m not going to tell you what it is… you’ll have to wait ‘til June. To meet some of the other writers who will be appearing at the Festival, you can visit Mummy Whisperer, Hertfordshire Mummy and Being A Mummy. I have a family ticket (four tickets, minimum one adult) to the Hoo’s Kids Book Festival to give away. The winner will be chosen at random. The competition closes on Wednesday April 3rd at noon, and the winner will be notified by email that afternoon. Within 7 days of notification the winner is required to email confirmation of acceptance of the prize to DorkyMum, along with a postal address in the United Kingdom to which the prize can be sent. If the winner doesn’t provide such confirmation their entry will be disqualified and an alternative winner will be chosen. The prize cannot be transferred and no cash alternative is available. The decision of Ruth Dawkins will be final and no correspondence will be entered into. Disclosure: I have been provided with a family ticket to attend Hoo’s Kids Book Fest, and a ticket to give away in this competition. I have received no further payment for this post. Update! Wednesday April 3rd. Congratulations to Claire who was drawn as the winner of the competition. An email is on its way to you right now with details of how to claim your family ticket. Second update! Unfortunately Claire didn’t get back to me with her details so I had to draw a second winner. Congratulations BeingMrsC! Sounds good, kids would love this! Oooh – Guy Parker Rees spent a day at Mandeville for World Book Day and absolutely captivated every child – so Please enter me into the Hoo Kids Book Fest competition – looks like fun. Please enter me into the Hoo Kids Book Fest competition. I might FINALLY get to go to Luton Hoo even though it’s just up the road I’ve never been! Please enter me into the Hoo Kids Book Fest Competition! Sounds fab! Please enter me into the Hoo Kids Book Fest competition! At last, a cultural enrichment event for kids that’s local! Please enter me into the Hoo Kids Book Fest competition. Please enter me into the Hoo Kids Book Fest competition, we love poring over books and love the sound of the festival too. Thank you! Sounds like a great book and I would love to know what the best job is (but I would say its being a mummy)! Can’t wait for the Book Fest. Please enter me into the Hoo Kids Book Fest competition. I have books that I want Clare Beaton to sign!